Water and energy networks are inextricably linked. Energy production and electricity generation both require water. Conversely, treatment and distribution of water to consumers and wastewater collection and treatment depend on energy. There are multiple other connections between these two fundamental resources and therefore new paradigms are needed for increased usage efficiencies to minimize energy water conflicts, especially when considering that climate change will significantly impact both. Water has traditionally been abundant in the US, even in drier parts of the country where large, federally funded infrastructure projects have literally made the desert bloom. Energy was also largely readily available so there were few conflicts between extracting and generating these resources. Due to multiple factors including climate change, it is clear that previous water management and energy policy strategies will not meet the nation’s needs, especially in drier regions of the country. A particularly pointed example is California, where 19% of the TOTAL energy used in the state goes to pumping and treating water for irrigation and potable uses. Another inextricable link between these two resources is the amount of water that is required to extract individual fuels. While solar and wind are generally considered to have a zero water intensity (it can be argued there is a small amount of embedded water used in the manufacturing and materials), the production of biofuels in the form of irrigated corn can result in a water intensity of 16,000 gallons/mmBTU. These numbers compare to less than 10 gallons/mmBTU if natural gas is used to generate electricity and less than 200 gallons/mmBTU if enhanced oil recovery with water or steam is used. To a significant degree, agriculture also influences how water and energy overlap in a region. Agriculture uses 80% of the nation’s ground and surface water available for consumption while many Western States use more than 90% for this purpose. Clearly, water management and energy policies do impact how these two resources intersect and function in a region. What are the best ways of coordinating energy and water policies to maximize overall benefit? Should the water intensity of a fuel source (gallons/mmBTU) be considered when setting local, regional or national energy policy? To what extent can technology advances impact this dynamic? What are the barriers that will prevent significantly improving the efficiency of the energy-water nexus? Ken there is new technology coming on line that will drastically lower desalination costs. I have see it work in person. At present they are scaling it up and the first uses will be ethanol producers to separate water from ethanol. It will allow a far different use of water for many places and for ocean communities a total reliance on ocean water is possible with the potential of much lower costs. One of the first and most important things is to integrate water resources into energy planning. Energy models used for long-term planning by governments, utilities, ISOs, and others generally ignore water constraints entirely. This makes sense as only recently have the impacts of drought on electricity infrastructure can be realized. However, these impacts can be significant – including large reductions in hydroelectric generation, forced outages at thermal power plants, and potential reductions in combustion efficiency resulting from high water temperatures. Long-term energy planning and energy economic models generally ignore these factors entirely. This needs to change, particularly in drought prone regions. 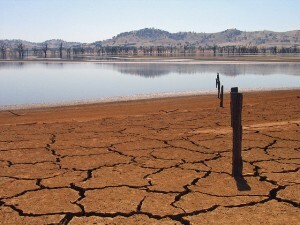 Beyond modelling, there are key regulatory and industry actions that can mitigate the impacts of water shortages on electricity infrastructure. Better inter-regional coordination can help by limiting the impacts of regional drought, such as the large decrease in hydro generation in California during the last several years. Water impacts on electricity infrastructure vary depending on region. State utility commissions should determine potential vulnerabilities and work with utilities to limit potential impacts. This may lead to increased use of renewables, new transmission lines, or prioritizing less water intensive cooling technologies at thermal facilities (potentially leading to retrofits at existing power plants). Of course, with water resources heavily impacted by climate change, the electricity industry needs technical assistance from the government and the scientific community to understand regional risks and climate projections. The federal government is beginning to address these challenges, but significantly more coordination with, and receptiveness from, state commissions is needed. Water and electricity are currently managed separately even in regulatory agencies tasked with overseeing both. The technical details of water and electricity provision are so different, it is hard to consider them together. Electricity must be used as it is generated. Electricity “leaks” cause loss of life and property. By comparison water is relatively well behaved. It stores well and can be transported easily. Leaking water lines cause little danger to life and health. The obstacles to joint water and electricity management are substantial. The case for collaboration is compelling. Consumption behavior can take the electric system down and overwhelm water provision systems. Modulating consumption during high stress periods may provide new levels of relief to both. Understanding the positive and negative synergies of water and electricity consumption will enable informed decision making in the context of climate change adaptation and planning for population growth. The Appellate Court in Rochester has invalidated the contract a Pennsylvania municipality had with a subsidiary of Shell Oil to purchase 1 million gallons of water daily from the aquifer that underlies the town of Painted Post. Further sales of water to support the hydraulic fracturing operations in Tioga County are halted by injunction. Evidently the community officials who signed the agreement called the water “surplus property,” allowing them to avoid any consideration of the environmental impacts to the drinking water supply of the town, including the size of the withdrawals. There is reason to worry. Some years ago a Texas town was pumped dry by frackers, leaving the community without water. 38% of water withdrawals in the US are electricity sector withdrawals. Generating electricity for retrofitted buildings from solar and wind with an emphasis on onsite generation and geothermal heat pumps is the best way to reduce the use of water to produce energy. Recently, the DOE Wind Vision Report (DOE 2015) demonstrated how achieving 35% wind penetration by 2050 could result in water consumption savings of 23% (DOE 2015). Your suggestion that water intensity be included in policy decisions to evaluate energy generation choices is a good thing, however the water connection should include life cycle consumption of water, not just the intensity of use as part of generation. A fracked gas well can require up to 10 million gallons of water. The water is not just withdrawn, it can’t be returned to the water system because it contains toxic minerals from deep in the earth, including radon. Certainly water use in PA is not as critical as it is in CA or TX, but still should be included in decisions. Drillers have begun attempting to reuse at least some of the water, known as ‘flowback’, that is returned to the surface by reinjecting it into old wells. Reinjection was the first disposal solution the industry came up with when it acknowledged that the water could not be returned to the water cycle. However, the link to earthquakes caused by the reinjection of pressurized water into old wells near fault lines has now become clear. In Oklahoma the fracking boom of the last five years has been correlated with a dramatic rise in seismic activity. Prior to the fracking boom Oklahoma experienced an average of 3 earthquakes a year. Recently the state recorded 70 in one week. Water withdrawals and consumption are 2 different things and should be treated differently when policy is considered. Both coal and gas generated electricity use a considerable amount of water. Coal is on its way out as a fuel to produce electricity primarily because of its additional air and water pollution issues, but I believe fracking’s problems should put the brakes on natural gas as coal’s substitute. Gas has erroneously been labeled better for the environment because it reduces harmful emissions of Green House Gases, a conclusion that depends entirely on how you do the measurements, and dismissing fracking’s environmental issues, given a pass by the Bush administration, should not be allowed to continue, including the industry’s water use issues. Glibly, the best solutions require a new utility structure, a focus on efficient buildings and cars, and as much renewable generated on-site and utility scale wind and solar as possible. The biggest barrier to the transition to a clean energy economy is the financial and political power of the fossil industries and some very stubborn utilities. The tables below contain data published on waterfootprint.org by the University of Twente, the foremost authority on water footprint that is also officially recognized by the UN. Water footprint includes both water that is consumed and water that is polluted. To make it a meaningful metric of comparison for energy sources, the data is presented in units of water versus units of energy service delivered (i.e., the water-intensity of energy). A convenient unit of energy to use is the combustion energy of ethanol, and that lets the comparison be liters-to-liters or gallons-to-gallons. High numbers are bad; low numbers are good. These numbers tell the story of the intersection of water and energy. They also illustrate why, in a world where 1/3 of nations today are water poor and 50% will be water poor by 2050, an “all of the above” approach to energy does not make sense. Biomass and biofuels are neither green nor sustainable nor moral when water footprint is considered (or land use, or agrichemical runoff, or “green grabbing”, or food competition, or energy balance, etc.). In terms of human deaths and damage to the environment per unit of energy delivered, nuclear is by far the gentlest. Hydro-electric is by far the deadliest. Dam collapses are the big killers in the history of electric power, and the land footprint of impounded water reservoirs behind dams is huge per unit of energy. Coal and petroleum and natural gas are not the water culprits that many try to make them out to be, for power generation, plant cooling, or fracking. Agriculture is the biggest water consumer and water waster, and water rights reform is long overdue in the United States. Fracked gas comes so plentifully and at such a positive energy balance, that it is becoming more economical to use that energy onsite to recycle the fracking fluids and purify the water to meet local discharge standards, rather than to haul it all to a waste site. Even more intriguing, is that the source of the fracking fluid water in the first place is more frequently becoming local salt water from ubiquitous deep saline aquifers. Some of the energy from the gas can be used to desalinate this water, and thus produce new fresh water on the surface. Depending upon which is more dear in the location where fracking is happening, the whole operation can be optimized to use in situ water to produce gas, or in situ gas to produce water. Fracking may actually represent a fresh water production revolution in nations such as Saudi Arabia that are fuel rich and water poor. This is a game changer that many do not yet appreciate. I very much like you proving the statement that there are lies, damn lines and staticics. The most dangerous source of electricity is the best I have seen in a very long time. There are so many holes within it I will not take the time to refute them but having been in Ukraine I think that would make your nuclear number go up considerably. What is your critical problem is that there are technologies that are hydro based that do not require dams but are run of current systems. This new technology combined with water bubble water purification systems will allow a far less expensive solution to both polluted water and cultivation water in general. This latter technology is just coming on line from lab to production in the ethanol world as I write this. I would not expect you to know about it but it is coming and it could easily cause a revolution. I would tell you more but I am restricted by numerous non-disclosure documents I have signed.